Shark Guy. Toggle Man. Junk Box Cowboy. 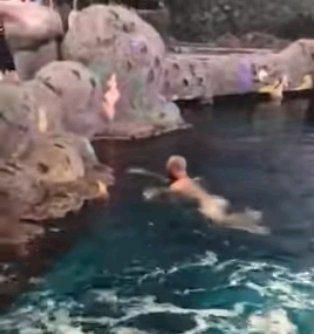 X — or a fuzzy blur — marks the gonads spot on footage uploaded to YouTube and elsewhere of the fellow who went for a swim in the shark tank at Ripley’s Aquarium in downtown Toronto last week as gawkers, well, gawked. Yes, pale buttocks (uncensored) and male dangly bits can be quite scary. I am required to insert “alleged” all over the place as none of the criminal charges have been proven in court. So just mentally stuff an “alleged” here and there while I dispense with the formality for the purpose of narrative fluidity. A fully clothed David Weaver — red and white striped hoodie, sweatpants — appeared in Old City Hall court Friday, was granted $1,000 bail on consent and sprung from the can. He’s been charged with assault causing bodily harm, mischief under $5,000 and mischief/interfering with property. Those conditions encompass the usual: to reside with his surety, have no contact with the individual Weaver is alleged to have punched in the face in a separate incident earlier that evening, to undertake counselling for alcohol abuse and anger management as directed by his surety. Because Weaver, who has roots in the GTA, actually lives in Nelson, B.C., the surety had to post a deposit upfront at twice the usually required amount of $1,000. Now, to be clear, these weren’t man-eating sharks, à la Jaws. The 766,000 gallon Dangerous Lagoons tank is populated with sand tiger sharks and sawfish, some of which can be seen swooping in and out on footage captured by an underwater CCTV camera, apparently utterly uninterested in the species kicking his legs dog-paddle style. Oh, also moray eels inhabit the tank. Which are dangerous but shy, preferring to hide in holes and crevices. Honestly, I looked into buying the dive as a gift for a friend just last month. Skinny-dipping, however, isn’t part of the gig. There’s no underestimating the bizarre stuff people will do for kicks or for thrills or simply because they should not, whether scaling construction cranes or jumping into zoo enclosures. “I’m sure the question you all want an answer to I can’t give you right now,” Blair Drummond, Weaver’s lawyer, told reporters outside court. That would be the why of it. Video shows a man, looking totally relaxed — and this was before cannabis became legal in Canada — swimming back and forth, at one point clambering onto some rocks where staff awaited, then back-flopping back into the water. Must have been too slippery for capture because the naked suspect got clean away, amidst a cheering crowd. Weaver was arrested by Ontario Provincial Police in Thunder Bay four days later and returned to Toronto. Was he drunk? Was he high? “I don’t want to get into the facts of his condition at this point, until we know more,” Drummond said. Most of the bail hearing is under a routine publication ban, but the Star has obtained some details of what purportedly happened that night from other sources. Earlier in the evening, Weaver was allegedly ejected from the Medieval Times Dinner Theatre on Dufferin St. for causing a disturbance. Once outside, it’s alleged he kicked and smashed a glass door, then approached a 34-year-old man and assaulted him. It’s believed this was a random attack. The victim suffered injuries serious enough that he had to undergo dental surgery. The assailant fled before police arrived. A couple of hours later, the suspect emerged to submerge himself in the aquarium tank, shedding his clothes before hopping over a security barrier. Those clothes were handed to a woman described as a “female accomplice,” although no further charges are anticipated. When the suspect hotfooted it from Ripley’s, sources say he left behind his shirt, which contained a bank debit card. That gave police an identity to pursue. Aquarium general manager Peter Doyle told the Star the popular tourist draw is reviewing security measures with police but there are no plans as yet to make any changes. I mean, you can’t take preventive steps for everything. Weaver’s bail conditions say nothing about consorting with the fishes.